You may want to jot this down in your Evernote app. "We're not just an app anymore," declared CEO Phil Libin in a blog post, posted in conjunction with the company's EC3 conference, taking place today and tomorrow in San Francisco. So what is Evernote now? A lifestyle company, that's what. The organization app maker is launching a host of new products to match its new brand focus, what it's calling "Evernote Editions." 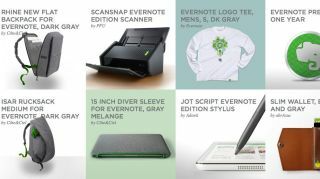 Among the new, ahem, editions to Evernote's product line are a $495 (about £308, AU$529) scanner, made by PFU, and $74.95 (about £48, AU$80) Jot Script Evernote Edition stylus by Adonit. Traveling farther afield are "crafted Japanese lifestyle goods" made by Abraus, a pair of backpacks and a commuter bag. "That's right. We're a fashion brand now. No one saw that one coming," Libin jokingly said during the conference today, as reported by CNET. He may be more serious than he let on: You can also now buy your very own Evernote socks, too. To purchase these new Evernote-eared items, the company set up the Evernote Market, a place where residents of the U.S., Canada and Japan can purchase its physical goods. Availability for more countries is on the way, and shoppers will be able to find the items both online and in Evernote apps. This all comes on the heels of official word that Evernote is partnering with 3M to give the iconic Post-it Note "a digital life." Evernote for iOS 7 will see a new Post-it Note camera, letting users take multiple photos of Post-its in a single go and transferring the data just as it does other notes. The Post-it Note camera will also recognize different colored Post-its as having assigned meanings to better organize your scribbles. Oh, and Evernote also created its own Post-it Note holder, because of course. It's a bold move from the app maker to jump so fervently into the world of physical goods, but it's certainly not not unheard of. Evernote had to look no further than Amazon's empire or Google's own initiates to think, "We could do this, too." What's more, this is likely the first wave of many more physical goods branded by the elephant-eared company. You've got to have some gadgets to fill your Rhine New Flat Backpack for Evernote, right? Post-it Notes are colorful but you know what else is? The iPhone 5C, that's what.